I went to JoAnn Fabrics last week to get an item to finish this wedding present. While I was there, I noticed bolts of cloth sitting on a rolling cart. Oh my. Carole's boyfriend, Larry, is a huge Star Wars fan. He also doesn't have a Hawaiian-style shirt made by me, in a loud fabric. I could certainly use one of these prints to make a shirt. This one was particularly attractive to loudness. So I asked Carole which print would be the most attractive. I have no illusions about whether the shirt would be worn. It was more the idea of him having a shirt this "loud" in a print he would like. It's the proverbial Christmas gag gift. Carole's response? "Um...how about curtains, mom?" Now, I haven't made curtains in years, decades even, but rod pocket curtains are very easy to make. The problem, for me, is doing the math to figure out how much fabric I need. But, heck, I can do this. It will be fun. Normally, I would wash the fabric to get the sizing out of it, but, for curtains, I don't have to. 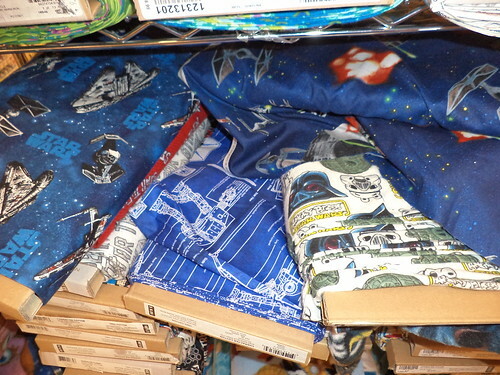 My friend, Pam, and I sat in JoAnn Fabrics surrounded by all the bolts of Star Wars AND a bolt of Star Trek fabric because Carole said that would be cool, and did math. In the end, I didn't need that much fabric to cover 4 windows. I have curtain material for the side door, above the kitchen sink, the dining room and the home office. Now, about that chunk of Hawkeye fabric on the end there. It was off to the side. Someone had taken the rest of that bolt and this was to be added to the remnant pile. 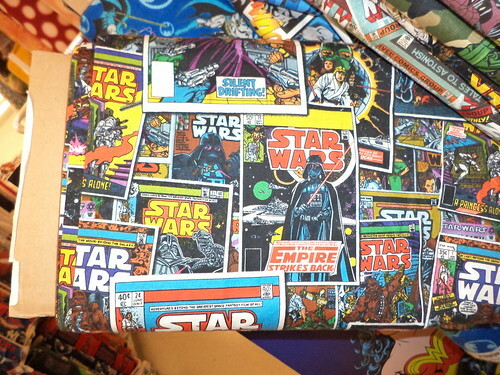 It's about a yard in length and is 60 inches wide so there is a lot of fabric. It's soft. It's a very soft flannel. As I was waiting to have my fabric cut, I could hear it whispering me. "Hi there. You're a Hawkeye fan. I know because you keep looking my direction. You've picked me up a couple of times, too, and noticed I have football and basketball emblems on me, as well as Herky and the tiger hawk. Buy me. I'll be greatly reduced in price because I'm a remnant and the only piece of this bolt left in the store. Buy me. You know you want to." I got the remnant for 75% off. Since this fabric wasn't on sale, that was a big reduction. The rest of the fabric was on sale for 30% off AND I had a coupon for an additional 15% off everything. Not bad for curtain material. I did purchase material for the shirt. That will show up in another post. I have no idea what I will make with the Hawkeye material. I have two other chunks I need to do something with. 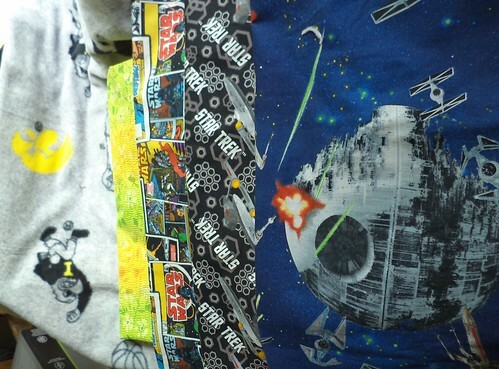 Maybe I should consider that Hawkeye "patched-look" blanket I've been thinking about making. I am on a deadline. I will be back in Virginia in October for a Highland games and I want to bring the curtains along at that time and hang them. The shirt can wait for December and Christmas. There is a book on the ottoman I should finish reading. I'm up to book number 8 and I don't want to abandon the drive to read 12 books this year. So many things to do. But, this is my next project and I'm excited to get started just as soon as I clean off the table.